English wines are starting to make the news more frequently over the past few years after producers like Nyetimber’s 1998 Blanc de Blanc won a gold at 2009’s Chardonnay du Monde and other estates such as Gusbourne and Furleigh Estate clinched Silver at the Effervescents du Monde 2011. Perhaps one of England’s most prominent wins so far is the Ridgeview Estate 2006 Grosvenor Blanc de Blanc for best Sparkling wine at Decanter’s World Wine awards. What is going on in the English wine industry? I head to the Wine Pantry in London to find answers. Many people may not be aware, but wines with bubbles may not actually have started in Champagne as many would think, but England. The process of Sparkling wines was first recorded in 1662, where a scientist named Christopher Merrett explained to the Royal Society of London how adding sugar to wine produced bubbles. Merrett’s findings were based on the English’s love for cider production. Some believe that the British were adding fizz to wines imported from Champagne a decade before sparkling wines were produced in France. In the 15th century, Monasteries in England were making wines but when Henry VIII separated the Church of England from the Catholic Church, the monasteries were abolished and the wine industry died with it. After six centuries, we are seeing a resurgence of wines produced in England and no longer in monasteries. The 1950s saw Hambledon as the first winery, followed by Nyetimble in the Seventies. There was an explosion of plantings in the Nineties due to rumours of restrictions in the form of permits needed to plant grape vines. As of today, England has 403 wineries with a total production last year of 4 million bottles of still and sparkling wine. This is expected to grow tremendously to an additional million now that Rathfinny Estate has just purchased 160 hectares of land near the coast at Alfriston, East Sussex, just 141 kilometres from Champagne in France. Perhaps there is no better timing for English wine industry to enter the wine game with the onset of global warming over the last century. With a climate that is extremely cold, the weather is subjugated to the vagaries of rain and the lack of sunshine. It is possible that we are looking at the same climatic conditions which were similar to what Champagne was experiencing two to three centuries ago. Ripening of grapes throughout the world is getting earlier over the last decade with harvest in England starting from early to late October. In fact, the soils of Kent, East Sussex and Hampshire are almost similar to Champagne’s chalky soil. Let us not forget that whites, reds and rosé wines are also produced at Gloustershire, Wiltshire, Worcestershire and Warwickshire from exotic grape varieties such as Seyval Blanc, Bacchus, Madeleine Angevine, Kerner and Reichensteiner. These are mostly frost-hardy and early ripening varieties. The country also produces wines from more commonly used grapes such as Cabernet Sauvignon, Pinot Noir, Pinot Gris, and the latest being Malbec, which is grown and made into wine by Chapel Down in Kent. I headed down to the Borough Markets at the South of London to find out more. 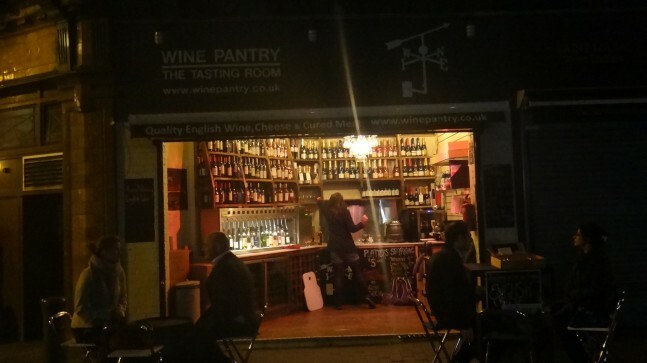 The Wine Pantry is London’s first and only specialist wine shop and tasting room specialising solely on English wines. The shop is located near the London Bridge Tube station and is only a 5 minute walk away from the station if you take tunnel heading towards Borough Street. It is the only wine shop in the vicinity that uses wines-by-the-glass dispensers to allow customers to taste 6 wines from a range of English wines brought in from all over the country for just £5. 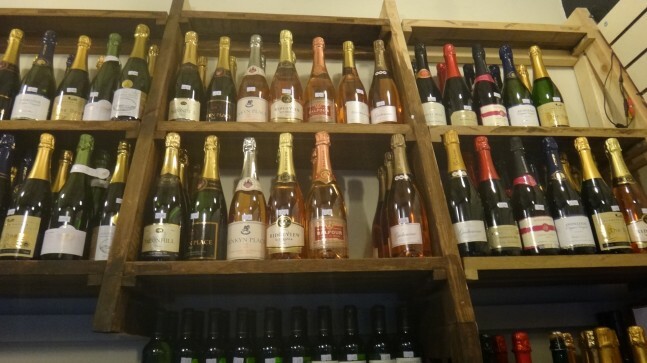 They are the only shop I know in London to have the widest range of English Sparkling wines with 24 different labels. Anyone who wishes to receive an introduction to English wines and try out wines made from exotic grape varieties should pay them a visit. The shop is the brainchild of Julia Stafford who used to work in the oil and gas industry before leaving her job in 2010 to open the store in May 2011 – coincidentally the same time as English wine week. She has a deep interest in sustainability and is completing her Masters of Science in Environmental policy at Imperial College. Initially, she wanted to start a carbon-neutral pub but lacked a suitable location. The idea of an English wine tasting room came when she realised that there none in London or England that features English sparkling wines for tasting, education and purchase from a single place. Since Chapel Down, Ridgeview, Camel Valley and Nyetimber are all big names supported by local supermarkets, the other wineries needed an outlet to feature their wines, apart from just relying from cellar door sales. Thus, the Wine Pantry was born. The store is also managed by highly knowledgeable and passionate staff. Dominique Hopgood is the store’s general manager and has an infectious enthusiasm to get you excited about English wines. Coupled with her immense knowledge about the regions and wines in the country, she has an amazing memory of production methods of each wine sold at the store and a story to go along with each wine. Constantly, there are curious customers from around the world popping in. They would walk in with a surprised look that England actually produces wine, only to be greeted with tasting samples and warm hospitality, and then leaving with both a new-found appreciation of English wines and a bottle. When it comes to selecting the wines for the pantry, the team does a lot of research by tasting and looking at price points, but the most important deciding factor would be to select wines which are good and positive representations of the industry. Six precent of the English wineries are represented in the store. Establishing themselves as a serious advocate of English wines in such a short period of time, wineries across England are now seeking them out. Supermarkets too are seeking their recommendations on English wines to put on their shelves. The largest vineyard now with 170 hectares in Surry is Denbies. There are three levels of English wines. From the lowest to the highest: English table wine, English Regional Wine, English Quality Wine. The English are known for their sparkling wines that are made from Pinot Noir and Chardonnay. However, some wineries are trying out different blends. Meopham Valley Vineyards has a sparkling Pinot Gris and Breaky Bottom does a Chardonnay/Seyvel Blanc blend. Most English wines retail between £19 to £37. The average is £28 for the sparkling wines. The right bottles have incredible value similarly to those of the small Champagne producers. Jancis Robinson named Stopham Estate’s Pinot Gris 2010 wine of her week going at £13. The English Wine Producers Association does the marketing for English wines. I headed down to Kent and Sussex mid-July last year to see the development of the vines. 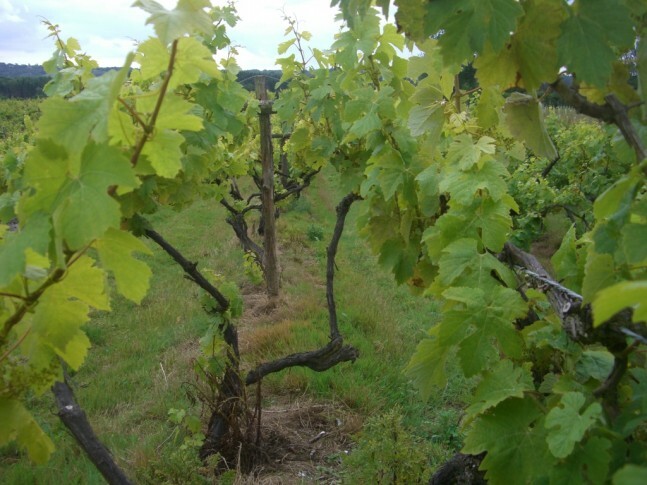 Unlike Champagne, the vines are planted more widely. Wire trellis systems are employed but we also find other types of canopy management such as Geneva double curtain and lyre system. More leaves are left on the vines to capture whatever sunlight the vines can savage from the already incremental weather for the development of the grapes. At the same time, too many leaves will lead to poor air circulation inside the vine’s canopy and disease can affect the vine. This is why Chaptalisation is permitted as they struggle is to get grapes ripe. Reaching sugar levels of 12° Baumé can be a challenge. Climate and temperature are the vagaries of English viticulture. According to Dominique, 2011 had a hot spell followed by some rain, causing a loss of two-third of the grapes from June to August. However, sugar levels are of acceptable levels. English Wine producers are already starting to break new ground and it would be foolish to ignore them as strong competitors in producing quality wines with warmer temperatures heading northwards due to climate change. Eglantine from Nottingham Shire has already produced England’s first Ice wine made from Madeleine Angevine called North Star for its 2006 vintage, which is retailing at €32. The wine is made using Cryo-Extraction and there are only 1000 bottles made. What are English wines like? I ask Dominique if English wines were considered new world or old world. She believes that English wines are a new industry and should not be put in either the old or new world camps, but should be considered as new frontier wines. In her opinion, if one were to generalise English wines, the profile would be aromas and flavours of elderflower, hawthorn blossom, and English strawberries. It is delicate on the nose but light and tingly on the palate. It reminds her of being in the countryside with hedgerows, floral and herbaceous growth on a warm summer day. For me, I find English wines to offer much more on the palate than on the nose. 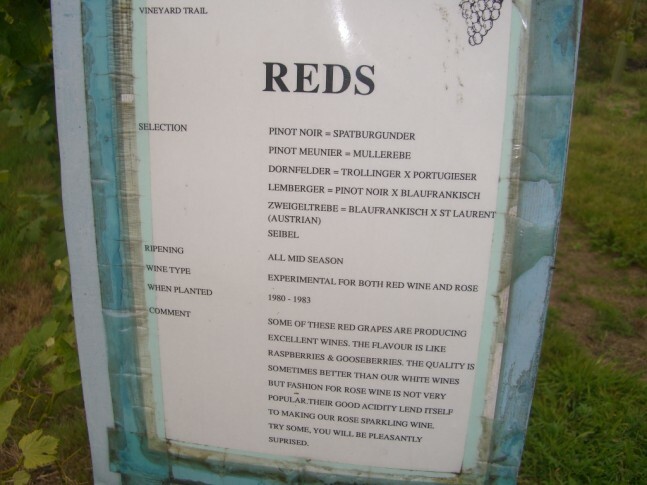 I also find the wines I have tasted to have very unique flavours such as mangosteen, aloe vera and coriander. These are flavours which are not your typical fruit-driven wines but they have an affinity to match many Asian cuisines which are savoury or have herb flavours such as Bak Kut Teh (a herbal broth of pork ribs). The low alcohol and high acid allows one to enjoy spicy dishes such as Singapore Pepper Crab without the extra alcoholic heat and with enough acid to cut through most dishes. I am quite impressed with the Quality-Price-Ratio of their sparkling wines. Their white wines are starting to grow on me with their unique flavour and low alcohol. However, I feel that their red wines have more room to improve in terms of tannin structure, flavour weight and ripeness. 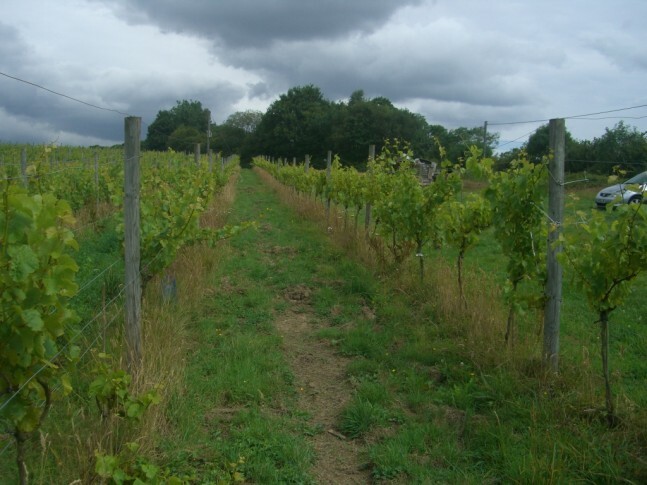 With the growth of English wines, it may be soon that we will see people turning towards English wineries for export to the international markets. Break Bottom is already exporting to Japan and Gusbourne to the United States. It is just a matter of time before the word gets around. Pale green with a good consistent stream of bubbles. Light spiciness on the nose with lemon curd, a light creaminess, medium minus intensity. On the palate, flinty, lots of mineral, citrus lemon, long length and well-structured. The palate has more intensity than the nose. Pale green and a very good stream of bubbles. Nose of ginger, cumquats, confectionary, apricots, light lees, med(+) intensity. On the palate, ginger, Japanese pickles, med(+) intensity, med(+) acid, medium alcohol, very long finish of citrus and nuts. A delicate wine. Organic wine and Dornfelder is the grape. Pale ruby colour. A light confectionary smell with watermelon. The palate has high acid, long length of cantaloupe and raspberry. Recommended to go with mussels. Pale onion colour. Light strawberries, med minus intensity. On the palate, high acid, delicate, tingly, light forest berries, medium length, light finish. Barrel Fermented in 2nd year US oak. Under cork. Pale green colour. Nose of custard, med Intensity, yoghurt, orange pips, lemon curd, an iodine smell. The palate is creamy, slight jackfruit, med plus acid, a papaya sort of flavour. Has a sort of lemon curd and passionfruit flavour in the mid palate, Med length with a iodine and slight nut tang to it. Re-tasted 48 hours: Nose is custardy, yoghurt with lemon curd hints, again not much change. Jackfruit aromas are still there. Has a sort of more mineral, silvaner smell to it that resembles eraser and whiteout. The alcohol and acid seems higher now. Under cork. Ortega is the grape. Pale green colour. The nose is medium(-) Intensity, peach, melon, vinous notes. The palate is high acid, lots of peaches, like a peach tea from Lipton. Short length, peachy finish. After 3 days: On the finish, it taste more winter melon and chrysanthemum to me now. The colour is pale green. Nose of uncanny spicy, smells like the sauce they use for Singapore black pepper crab and the coriander, med plus Intensity, something savoury in there, piquant on the nose, hints of guava and lemon grass, a sharp spiciness to it that you can’t miss like the gewurtz. On the palate, slight spritz to it, high acid, low alch, med sweet, a sort of spicy gewurtz thing to it, long length extended by sweetness and some hints of apricot/peach flavour, also some spice in the back. It resembles viognier except it is sweet. After a day, this is starting to smell like aloe vera more. Pale green colour. Very funky nose of coriander, spice and lemon grass. On the palate, high acid, lemon thyme, lemon grass, long length. Kerner is the grape. This wine is recommended by people at wine pantry to go with scallops and black pudding. Light green appearance. A nose of light fragrance, melon, light chutney, medium intensity. On the palate, chutney mango, high acid, long length and a heavy finish. A oily palate but freshness to it. An interesting wine. Even with the cold climate of England, they managed to grow this grape in a Victorian glasshouse. Pale tawny in colour. The nose is herbaceous, light black pepper, green chillies and medium intensity. On the palate, flavours of stalks, some herbaceousness, light currants, med(+) length, green bell peppers. Pale purple colour. Light peppery nose with beetroot. On the palate, slightly green, cranberry, medium tannins, slight rough texture, med length, juicy.